Running through these titles and the dollars they made, I'm quickly reminded of just how terrible January is for movies. I'm thankful we have the various awards shows scattered about these early months to help keep me interested, otherwise, it would be hard to go on. This weekend was no exception, as the slate of films releasing was "Hansel & Gretel: Witch Hunters", "Parker", and "Movie 43". You wouldn't expect any of these films to perform well, but with most of the Oscar nominated films already receiving their biggest bumps over the last two weeks, and very little outside of "Mama" doing anything of note last weekend, something had to give. One or two of these titles would surely resonate with audiences at least slightly; kind of a best of the worst type thing. 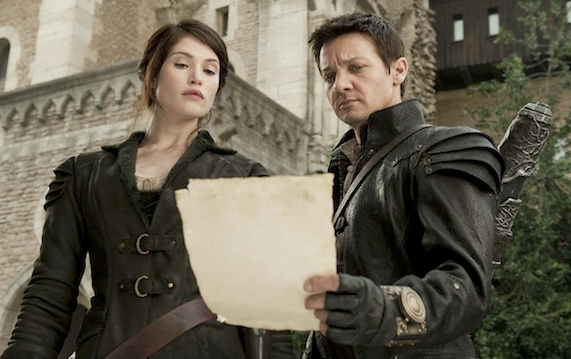 And well, much to Paramount Pictures' delight, that movie was Witch Hunters. The film somehow managed a respectable total this weekend, despite awful reviews. 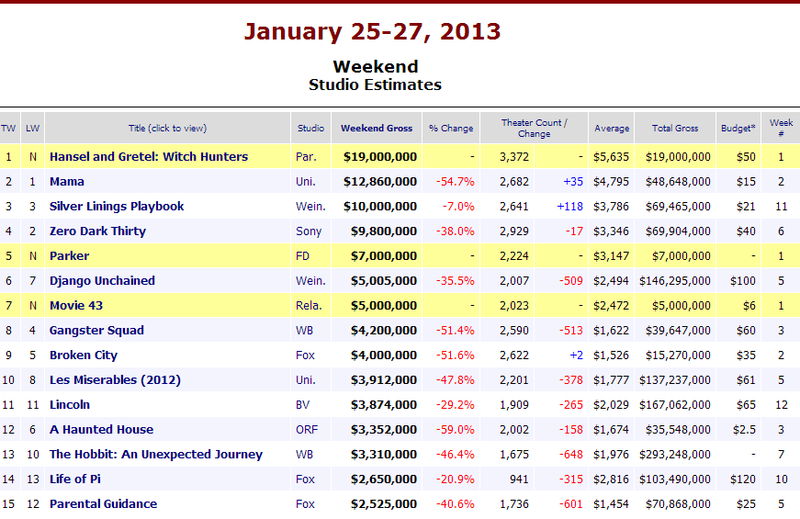 "Parker" and "Movie 43" - amongst similarly bad reviews - both flopped, barely resonating with audiences at all. Overall, this weekend could be the low point for the year at the box office. February and September traditionally holds some weak times as well, but with the total numbers being down this weekend by more than $50MM to last weekend's already muted numbers, it just wasn't a good weekend at the theater. Nathan and I had a friendly bet going as to whether or not "Hansel & Gretel: Witch Hunters" would crack 10% on Rotten Tomatoes. I said that enough critics would see the campy fun in it for it to land somewhere in 12%-15% range. Nathan expected 9% by today. And while no one's really a winner in this scenario, my predictions were just a little bit closer. The film has thus far managed a 15% on RT, with a few scattered critics praising its mindless, campy fun. Others, like Peter Travers, for example, point out that "this may be the longest 90 minutes you ever spend in a theater". So, quite the different ends of the spectrum with this one. I did not see the film, nor have much intention to do so, so I'll just get back to the statistics and let you decide whether or not it's worth your money. 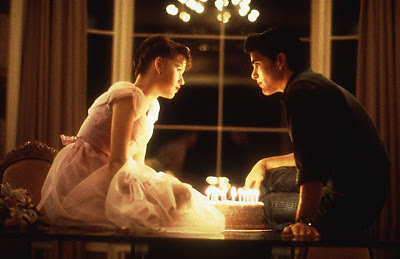 The film debuted this weekend with $19MM. While that's still well below its $50MM budget, you have to assume this is a huge sigh of relief for the studio. And considering that it's already racked up another $35MM internationally, it's now made up the bones of its budget. It's also worth noting that the other Bourne/Fairy Tale movie of comparison, "The Brothers Grimm", opened with only $15MM, but went on to earn more than $100MM worldwide. I expect Witch Hunters will slightly exceed Grimm's totals, but it shouldn't be by much. But who knows, the terrible "Van Helsing" managed $120MM domestically and more than $300MM worldwide. And while the genres are a bit different there, the styles at least seem similar. Why do we keep spending money on these terrible films? In second place was last weekend's surprise hit release, "Mama". This one has garnered much stronger reviews, and with the help of Academy Award nominated actress Jessica Chastain, the film has already amassed some respectable numbers. It made another $12.8MM this weekend, bringing its domestic total up to $48.6MM (add in the $2MM or so it's made overseas and it's just past the $50MM mark). And for a horror film with only a $15MM budget, while I don't expect many more notable gains from here on out, this one's already in pretty good shape. Third and fourth place went to a couple of Best Picture nominated films, "Silver Linings Playbook" and "Zero Dark Thirty". SLP, which actually saw a minor expansion this weekend, made $10MM, while ZD30 came in right behind with $9.8MM. Both have made almost identical amounts of money so far, each with a touch over the $69MM mark. Both budgets are well below this, so they're in the clear there. Both films have also reviewed exceptionally well, so we should see both titles hang around the top 5-10 for the next few weeks, at least. In fifth we finally see another new release in "Parker". The film made $7MM this weekend, and is Jason Statham's second worst opening film (in wide release) only to "Crank: High Voltage" ($6.9MM). That movie did go on to gross $35MM worldwide, so if that's a goal for the studio, that at least seems obtainable here. I feel like Jennifer Lopez will play better overseas than Amy Smart did internationally, so a respectable worldwide total wouldn't surprise me, either. There's definitely no milestones of note with this one though, and all things considered, a $7MM opening should be considered a disappointment for the studio. But the film that disappointed the most this weekend - both in total gross and critical consensus - was "Movie 43". The film brought together the largest grouping of notable and accomplished comedy actors I've ever seen, yet it still only managed $5MM this weekend. Luckily, the film's budget was only $6MM, so at the end of the day (not literally the end of today, just metaphorically speaking) it should have no problems surpassing that mark. But with a rating on Rotten Tomatoes of only 5% - yes, that number is correct - it probably won't do much more. It's unfortunate that this film didn't follow-through as it could have. I was looking forward to checking out this modern-day Kentucky Fried Movie, but it doesn't look they took it in a proper direction. I might check this out as a rental someday, but any minor inclinations I had of seeing it in theaters have now completely disappeared. No real notable milestones this week, but it looks like "The Hobbit: An Unexpected Journey" should break the $300MM mark domestically sometime next week (it's now over $900MM worldwide). Nothing else really stands out, but in a week where "Parental Guidance" can still squeeze into the top fifteen in it's fifth week shows just how uninspiring this week's lineup is.